Galley Wench Tales: Oz: Holy S---! Hitch-hiker discovered leaving Split Point Lighthouse, Great Ocean Road, ViIC Australia. Photo taken from inside through the window. Can you blame me? "Holy S---!" Wayne exclaimed -- loudly -- glancing in his rear view window, as he pulled out of the Great Ocean Road Split Point Lighthouse parking lot. Given the shenanigans we've seen from other clueless tourists on Australia's highly-traveled Great Ocean Road I'd figured something along those lines inspired his outburst. "You gotta see this! You are definitely going to want a photo of this," he declared. Still puzzled, he said, "Look at my rear view mirror." Huge as our rearview mirror is, a spider had claimed a substantial proportion of it. The Gary Larson eyeball cartoon, "Objects are larger than they appear," came to mind. I did indeed take a photo. I did not ask Wayne to roll down the window to take it. Nor did I walk around to the highway side to get closer to my subject, though normally I would. When we were in a safer spot, I did amble out with a folded section of paper, my usual transport strategy for bugs. This is the slot where the spider scurried to when I tried to dislodge him. The spider quickly scurried between the slot between the car body and the door, where the door hinges open. We were not sure if the spider could crawl inside our new-to-us car* from there! He crawled in deep enough I was unable to dislodge or squish him with my paper. *More on our van to 4-wheel-drive transition in a future post. We took off, hoping nervously for the best -- that our drive would dislodge the spider and he was unable to get inside our vehicle. Otherwise, Wayne planned to deploy chemical warfare on our next stop. When we stopped for groceries in Lorne, Wayne promised to do the deed while i shopped. Australia is the land of poisonous things and spiders here are definitely not an exception. We're not sure where this fellow boarded us - at our campsite the night before or where we parked at Split Point Lighthouse. In any case, Wayne joined me few minutes later in the market, looking proud. Afterward, he showed me his handiwork. Leo* - thank you for equipping our vehicle well. 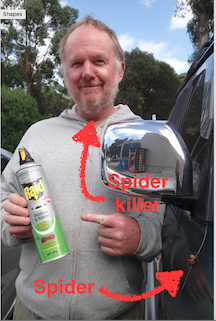 If the spider spray was inspired by an event in your travels, do tell, please! *Leo is the former owner of our "new" vehicle. In prior travels to Australia, I remember waking up in the morning and seeing a spider the size of my hand silhouetted on the outside of my tent. 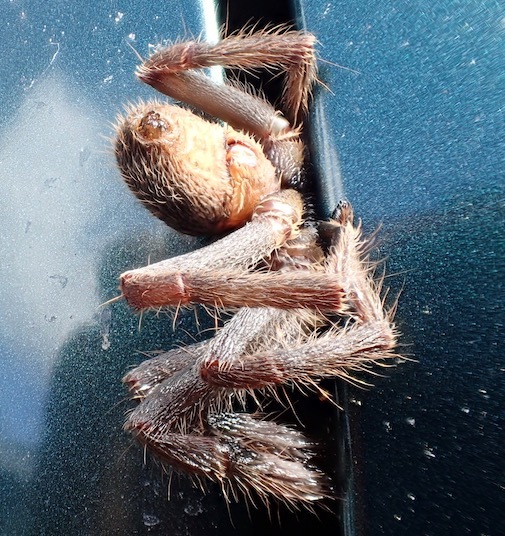 Still, the spider who attempted to take up residence in our car was one scary-lookin' dude! 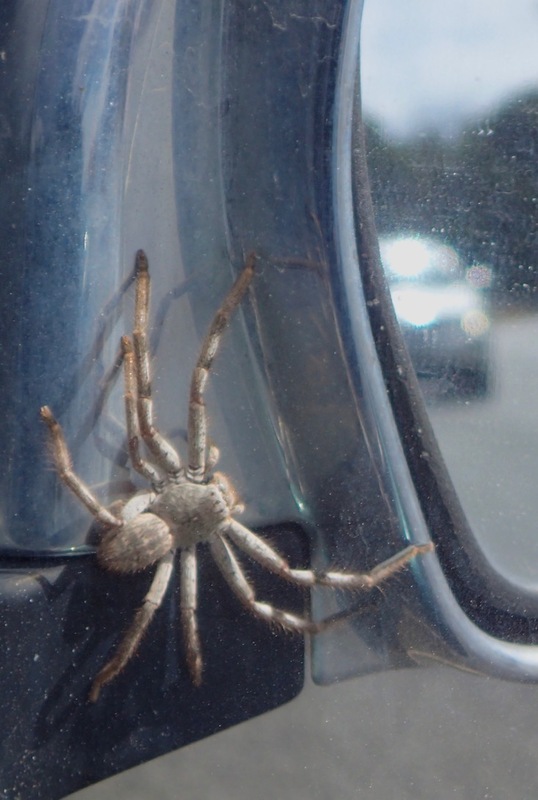 Thanks Amy Luck for identifying this as a huntsman spider, and Debra Butts for noting they don't generally attack people (though they are fond of invading cars and homes). In fact, after reading more about them, I feel kind of guilty about our killing this one, though headaches and nausea are kind of reason enough. We are currently in Port Campbell, Victoria, near the tail end of our Great Ocean Road tour. Lots of catch-up posts, still. Our wifi's will be off-and-on as we're often camping and prior to that we were scrambling to sell our van and replace it with a 4-wheel-drive. My Mac is now much more cooperative with photo downloads after my Mac "guru" friend Rob Plowman of iThings Bendigo "cured" when we visited him in Bendigo. 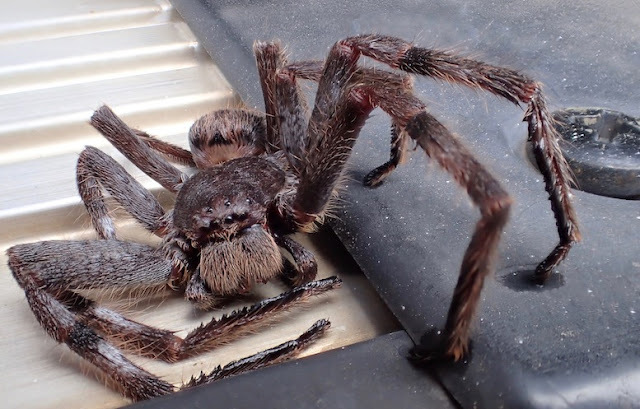 Today, April 12, 2017 upon loading some stuff into our Land Cruiser at a campsite in Western Australia's Cape Leveque when a startled huntman spider got loose inside. We were just getting ready to leave and weren't too keen on getting startled by a large hairy scurrying spider in our vehicle while 4-wheel driving. The spider disappeared before I could track and remove it. We were not pleased. Less than a kilometer underway I spotted the spider on the back of my leg! I gave a short scream. Wayne promptly stopped and I popped open my door and quickly hopped out into the red dust with a book in hand to flick the spider off my leg. "Show me!" a nervous Wayne insisted before I returned to the Cruiser. Not that Wayne's above asking for ulterior motives - in this case that was not his motivation. WIth no further ado, I stripped (no one was around) and Wayne backed up my confirmation wherever the spider was, it was no longer on me. I was reasonably sure the huntsman was finding a new cubbyhole somewhere in the bush. "Australia, and it's bugs..." sighed Wayne. We both breathed easier. Wayne hates spiders. No photos this time. Just relief. These days I don't worry about fast, but mild-mannered huntsman spiders any more, and was glad this one got evicted without getting killed. Funny, without looking for it, today I came across another huntsman spider story - click here to check it out. They're pretty cool, spiders actually, as long as they're not loose in your vehicle or crawling up your bare leg!